On September 11, 1914, the last day of Vermont’s annual Caledonia County Fair, a hot air balloon unexpectedly landed on the boardwalk in front of the grand stand where several persons happened to be standing. Three ladies were injured when the balloon came down on top of them, the most serious being a 66 – year-old woman who suffered a scalp laceration and bruises to the face. She was transported unconscious to Brightlook Hospital for treatment. It was reported that she was expected to recover. The accident occurred while Harold Cates of Boston was giving a parachute exhibition. 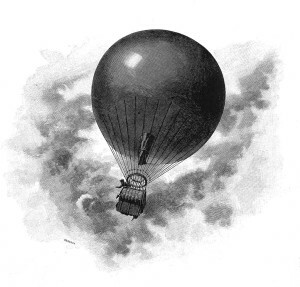 He’d ascended in the balloon alone, and at the proper altitude, jumped with his parachute, and landed safely on the field. The unmanned balloon came down upon the boardwalk.